We picked up where we’d left off so unexpectedly last week, with our intrepid explorers searching through the mulch and remains of the grick nest and picking out a few choice pieces of discarded equipment from the remains of previous and less lucky adventurers. Quickly handing out useful items, they then debated whether to continue further into the depths or to climb to the top of the ziggurat. On the one hand, there was the thought that Lucan would climb to somewhere impressive to make his last stand – and a ceremonial chamber might provide him with a suitable arena. Others noted that, as a vampire with only a short head start, he would need to secure a coffin to hide in when dawn broke in a few hours, and the top of a ruin might be less sealed from the light than the crypts below. In the end, the arguments for the crypts won out. The sound of a beating drum got louder as they descended into a room that was well below the level of the lake outside. Moss and fetid stagnant water had turned much of the decorations here into slimy masses, with dank curtains breaking up the view of the room. The drumming noise was revealed to be a lone animated mallet striking a drum on a small altar, so they grouped round to work out what it was. This gave the otyugh lairing in the filth here a chance to reach out and really get to know Kurtis. The tough tentacles snaked out from behind rotting curtains and pulled him off his feet, down into the sludge and the creature’s gaping maw. He quickly pulled himself out of its grip while the rest of the party cut the creature down, but the encounter left him smelling rather ripe. Beyond the otyugh was a large stone door, which some concerted effort soon got levered open to reveal a large semi-submerged crypt with dozens of sarcophagi. The water level in here was knee-high on most of the human-sized players, so Quilynn clambered up on Ruin’s back to keep dry as they started to move in. Her magic revealed undead to be clustered at the rear of the chamber. Unfortunately it didn’t seem to by Kurtis’ day when it came to tentacled creatures. A large ochre jelly – a mindless but hungry ooze of a creature – laired in the water, and wanted a taste of these new morsels. 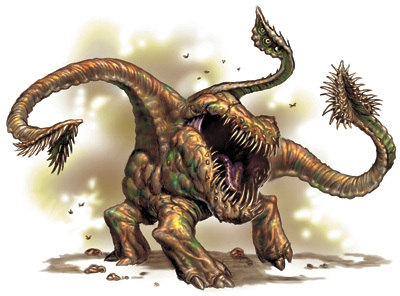 An early crossbow bolt shot by Quilynn prompted the creature to split into two smaller entities, which then eagerly approached the adventurers. 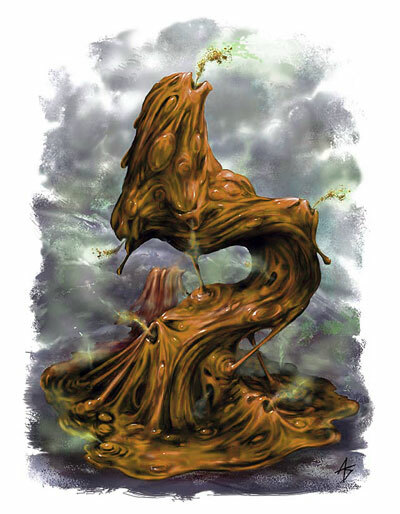 Koff worked out that bludgeoning weapons did not cause the ooze to split any further, prompting a quick change of weapons and tactics by the party. Kurtis tried to hide in the shadows of a sarcophagus, but didn’t realise that the creature was not relying on sight to detect its prey. Once more he found himself held and constricted by tentacles belonging to something eager to consume him. To make matters worse, the rest of the vampire spawn created by Lucan from the adventurers already at the ruins began to rise from their tombs, including the ones thought previously destroyed in the chambers above. One of them managed to hit Koff, draining his energy before Quilynn was able to turn them all. This had the effect of forcing them back into hiding long enough for her to stabilise and heal Kurtis from his wounds while the party subdued their voracious and acidic foe. Finishing off the vampire spawn wasn’t quite so simple, with Kurtis also getting drained before they could end the fight, but once the stakes were in and the proper precautions taken, the party felt secure enough to think about resting before heading back up into the ziggurat’s heights.